The shores of the Iroise Sea have always been the object of special care to defend them against possible landings. We are of course thinking of the Second World War, which saw the occupier build a quantity of bunkers housing huge guns. The Atlantic Wall was also intended, in our region, to control access to the port of Brest, a strategic high point with its German submarine base. But long before that time our shores were already carefully defended. What is left of it today? Some redoubts of the XIXth century and traces of fortifications dating back to Colbert, the king's Louis XIV minister. As for the guns, only memories remain because they have been dismantled and reused elsewhere. However, not all of them have completely disappeared and the walker will enjoy finding them, as below in a rather unexpected form. Here is a route that will take you from Lampaul-Ploudalmézeau to Locmaria-Plouzané in search of these ghosts from another time. We will start from the car park of the church of Lampaul-Ploudalmézeau. 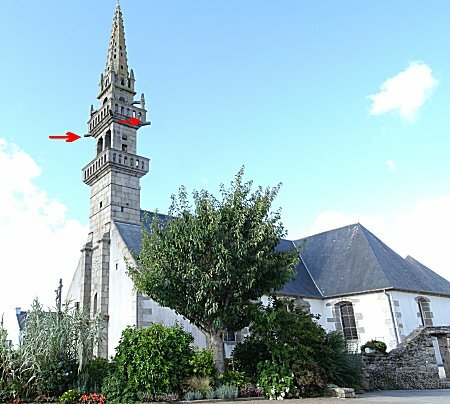 The beautiful church of Lampaul-Ploudalmézeau appeals to the curious visitor who details the ornaments of its bell tower	( visit of the church	). Under each corner of the large gallery, a kind of tubular stone gargoyle appears, gushing out above the void. 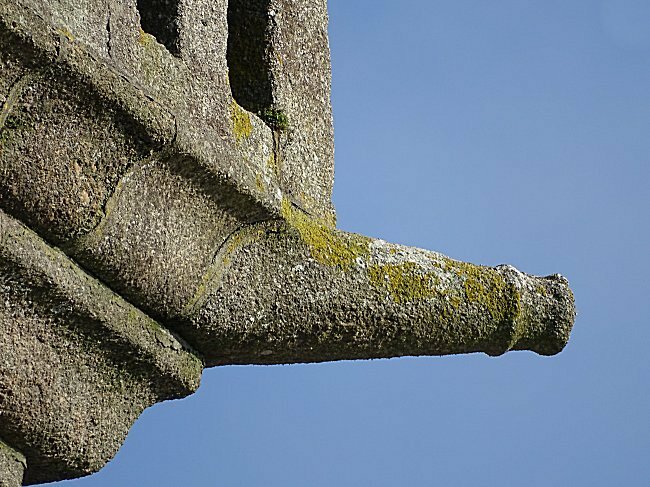 But in reality, they are not gargoyles to evacuate Rainwater : they have no openings. In fact, they are sculptures representing cannons. 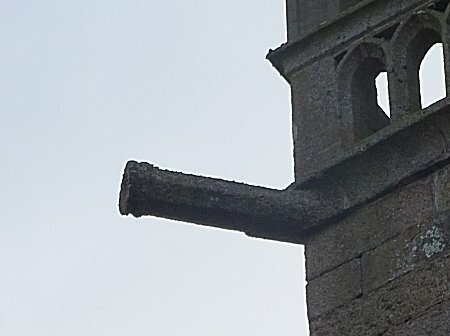 And cannons, even in stone, to decorate a place of worship, this seems surprising to say the least. 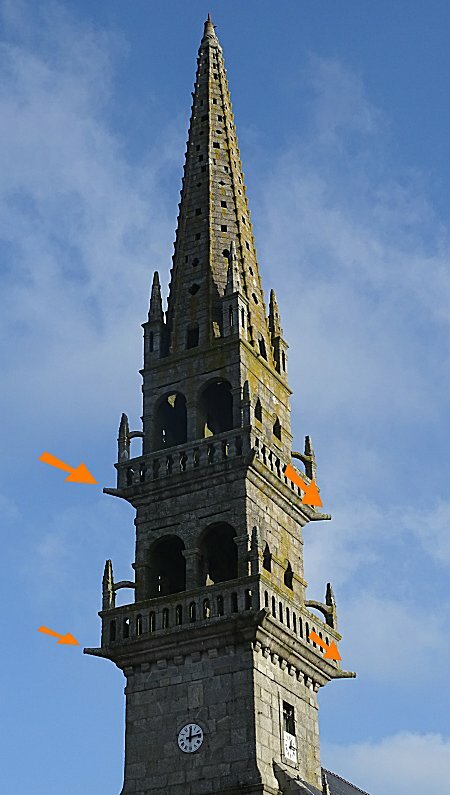 It is known that in the Middle Ages, many bell towers were fortified and had crenels and loopholes. From their top, you could see danger coming. In the absence of a fortified castle, the population could take refuge there under divine protection. 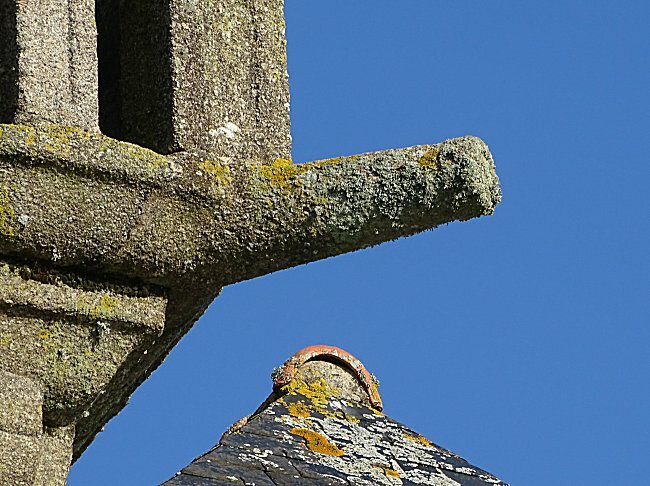 But the church of Lampaul-Ploudalmézeau is not at all medieval. It dates from the XVIIth century. However, it has replaced an older church, which was very medieval. It is therefore likely that these ornaments come from it. 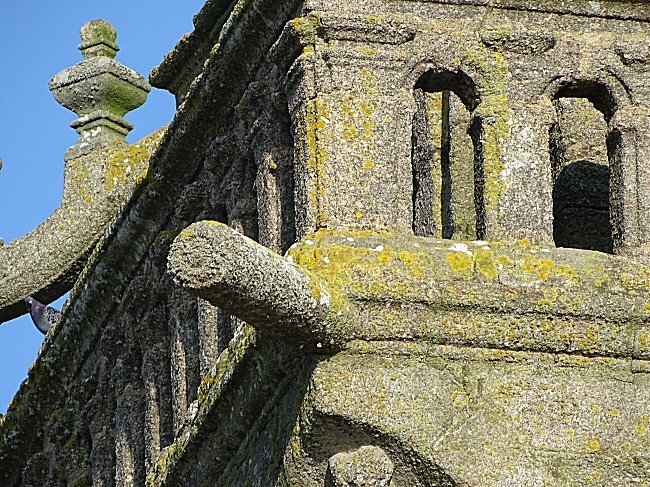 The architect's plan did not include them and the stone cannons were probably imposed on him. We will see later that this case is not an isolated one. Now let's see the bell tower of Ploudalmézeau, located only 3 km away. It is indeed here a battery of eight granite cannons that decorates the corners of the two galleries. And we can see that these elements have not been reported, but are perfectly incorporated into the construction. The church dates from 1857 but its bell tower is older since it was completely rebuilt from 1773 to 1776. The previous church was built in 1504. 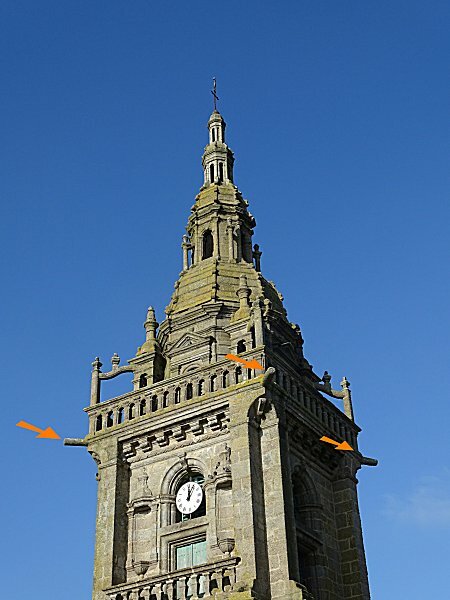 It is therefore very likely that the stones from the old bell tower were reused, as were the cannons. Let's now head for Lanildut. Access :	Exit Lanildut in the direction of Porspoder and take the first road on the left, towards the harbour. Park on the large earth platform at the end of the road and follow the coastal path. The battery is 200m away. This is a recent replica of a gun from the time of king Louis XV. 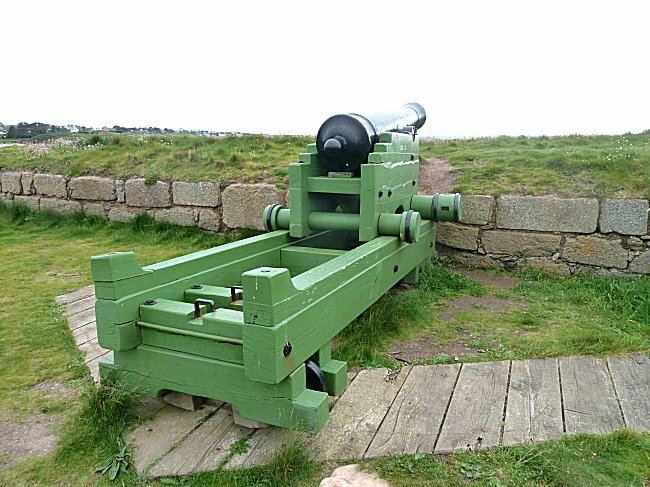 After uncovering the remains of the surrounding military structures and the platform of the Coast Guard battery, a cannon had to be installed so that the public could understand the significance of these installations. 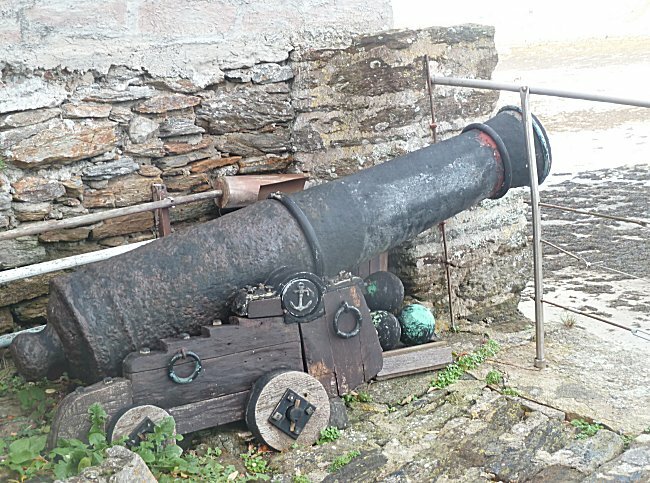 The mount was made by the students of a high school in Brest, the cannon itself was cast in a foundry in a mold designed for this purpose after a long documentary research. Before continuing this itinerary, you will find more details on the page of our website dedicated to the Lanildut Coastal Battery	( explanations here	). But let us now return to the village of Lanildut in a southerly direction. After the shops, a replica at 1/7th of the obelisk of Paris was built on a platform facing the harbour	( here is where the obelisk's base comes from	). Let's park here. 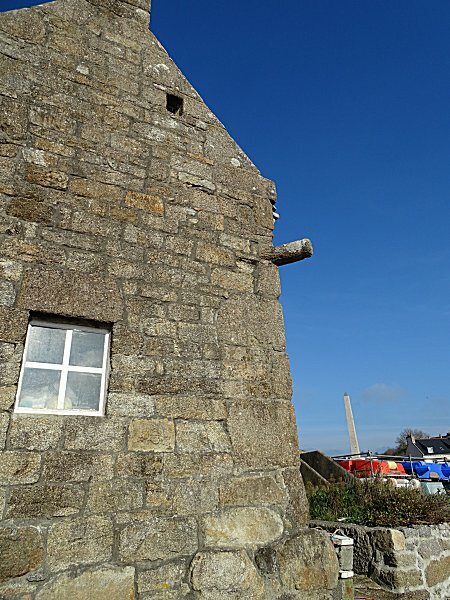 This time, it is at the corner of a private house overlooking the harbour that we can see a stone gun. It is possible to approach it and see it from the shore. Certainly, this house has survived the centuries. And its stone cannon, very eroded, still stands proudly towards the bottom of the harbour which was once located behind the road and which has been filled in. 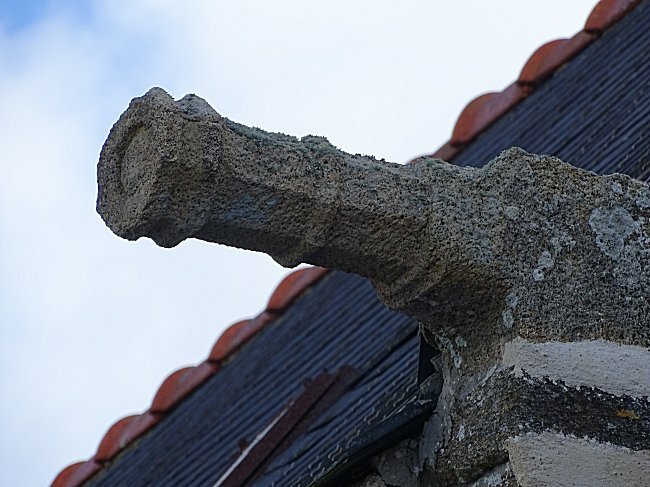 Private houses decorated with such a gun, as can still be seen on some churches, are rare. But what is now a private house may have once contained a small defensive garrison. Would it be some kind of sign, or simply a decoy? Access :	Kermarc'har is located in the countryside, between the village of Plouarzel and the coast. Leave Plouarzel in the direction of Le Conquet and at the roundabout continue straight towards Trézien. 1.5 km after the wind turbines, turn right towards the church of Trézien and cross the village	( visit of the church	). At the crossroads, turn right, leave Trézien and continue straight ahead. Cross a road and 500 m further on turn left into the dead end and park in front of the Kermarc'har manor house. 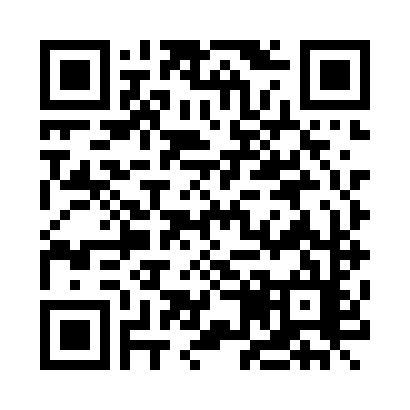 Be careful, the place is private, do not enter the domain. You have to approach under the tree near the entrance and look up to discover this sculpture located at the corner of the roof. 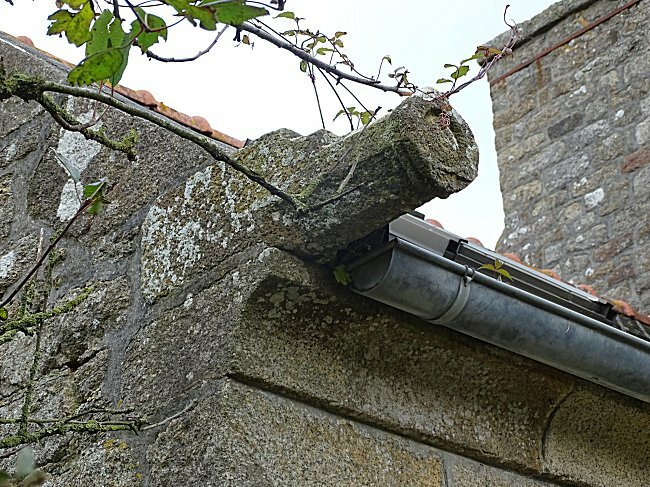 It's a granite cannon mouth, a crossette like in Lanildut. The tube does not have a circular, but an octagonal section. It is clear here that its ornamental function prevails over a true resemblance. 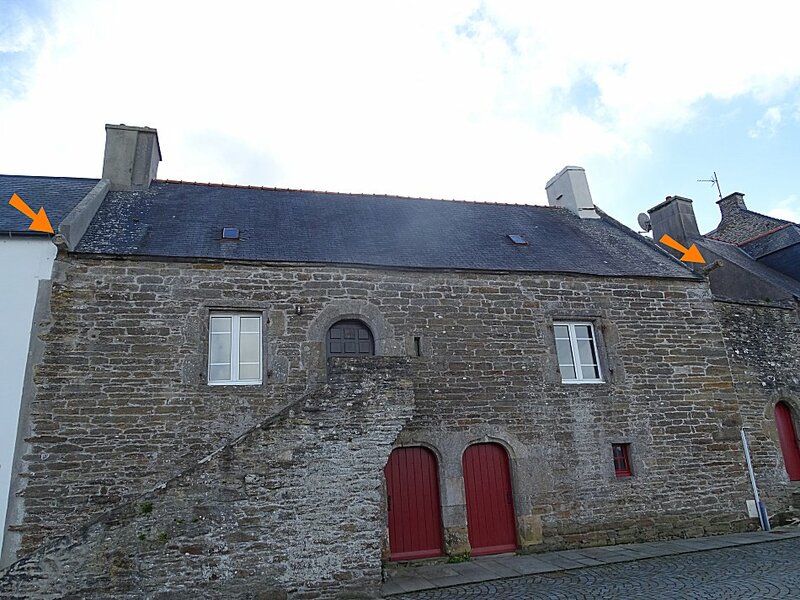 To fully understand the reason for its location at the entrance to this manor house, it should be noted that the residence is that of the family of Hervé de Portzmoguer ( 1475-1512), known as Primauguet, the famous captain of La Cordelière, the royal nave of duchess Anne de Bretagne. The sailor was probably born here. In 1512, during a violent naval battle outside Pointe St-Mathieu, and while his ship was clinging to the English flagship, he decided, it is said, to blow up the two ships rather than surrender. The explosion killed 2000 people and ended the naval battle. Placed there, the granite gun is unlikely to be a decoy. Rather, it reminds the visitor that the estate is that of a sailors family, one of whom sacrificed himself in battle. After all, in Lanildut, there is no evidence that the house of the obelisk was not also that of a heroic sailor. Let's now head for Ploumoguer. The name Ploumoguer has a certain analogy with that of Portzmoguer. But it is misleading because if we can translate Portzmoguer by the manor surrounded by walls, and we understand it well when we see the large moëllons of Kermarc'har, Ploumoguer translates into the parish on the walls, which would refer to Gallo-Roman ruins. Its St-Pierre church has a bell tower dating from 1753. 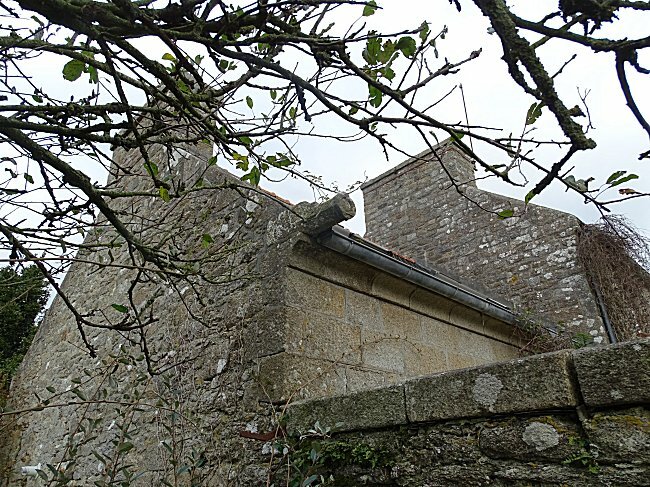 It has two galleries, but only the lower gallery has four stone cannons. Very rough and eroded, these ornaments could come from the bell tower of the old church. Let's continue on our way to Le Conquet. 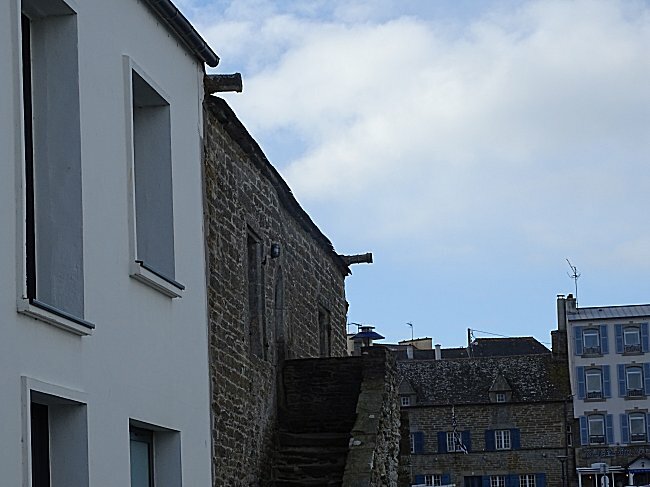 Access :	Park in the centre of Le Conquet and go down to the harbour via rue Lombard, which starts in front of the "Vents sucrés" bakery and pastry shop. At the bottom of this street, follow the quai du Drellac'h on the right until the end. - If the sea is low, get down to the slipway and walk along the shore. 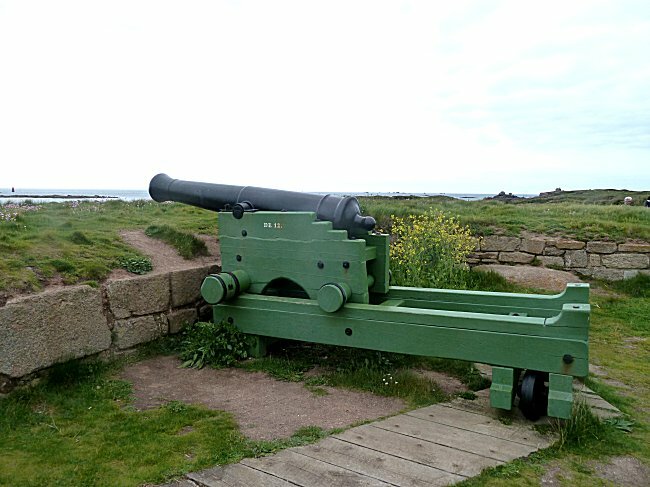 Behind the house overlooking the shoreline, a cannon is placed at the top of an another slipway. It has been very visible since the shore. Warning: access to this private slipway is prohibited. - If sea level prevents you from going down on the shore, follow the coastal path. After passing the house, you can see the cannon through the hedge. This is a 6-pound short marine gun that the former owner, when he bought it in the 1970s, discovered in the house's cellar. 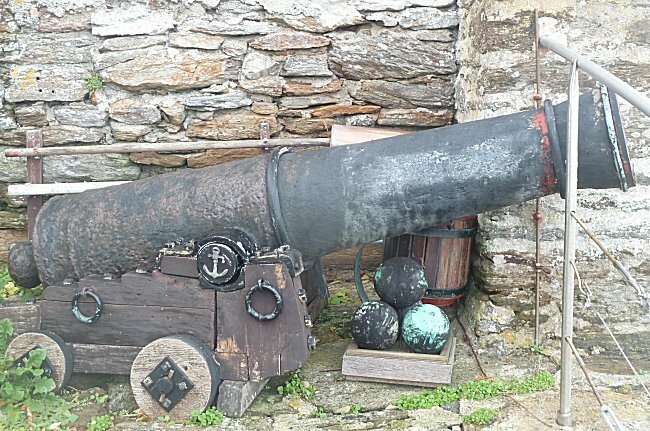 He carefully installed it at this location, accompanied by a mount and dummy cannonballs. These guns are quite frequently found in warship wrecks of the XVIIIth. They were gradually replaced in the XIXth by much more efficient models. From then on, these heavy bronze cannons were sold by weight in order to serve as ballast for cabotage sailboats such as the gabarres. As the cannon of the Drellac'h showed no sign of corrosion, it is likely that it did not remain underwater and was used as ballast. Let's retrace our steps, along Drellac'h wharf, and stop in front of this beautiful house whose imposing exterior staircase leads to the second floor. 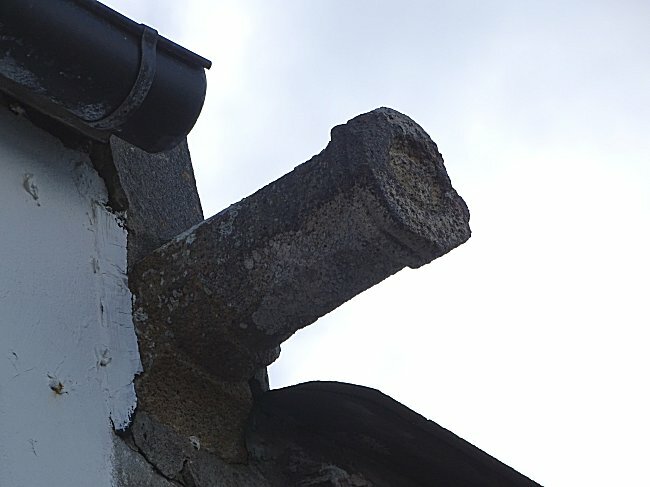 At both ends of the roof, stone cannons can still be seen projecting above the street. However, this very old house is not like a fortified residence. As in Kermarc'har, it was decorative sticks of octagonal section that probably adorned the home of a captain of a warship who wanted to recall his activity and his exploits. But let us continue to retrace our steps and go up the Lombard street. On the right side stands the imposing English house	( the small castle of Le Conquet	). It's a fortified house. It may have been rebuilt following the destruction of the Conquet in the XVIth century by the English. 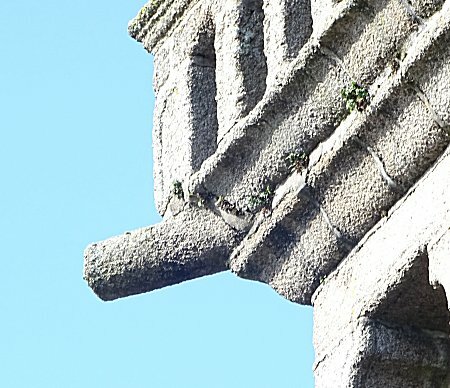 And the cannon-shaped crossette that dominates a corner of the building at a height of twelve metres cannot have a simple decorative purpose. Too far from ground level and directed towards the harbour, only its silhouette stands out against the sky. 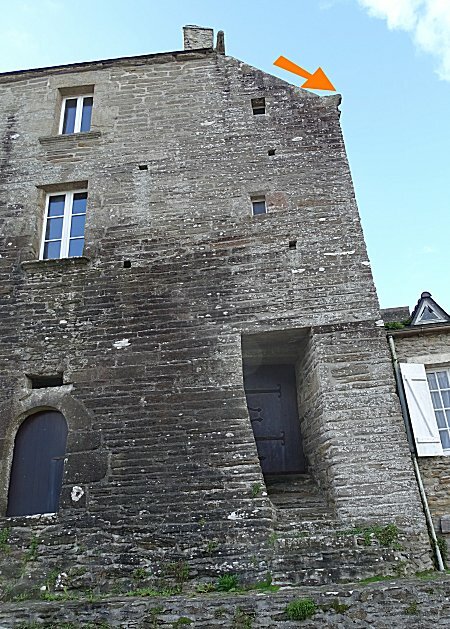 The "Little Castle of Le Conquet", as this fortified house is sometimes called, does not hide its defensive character. 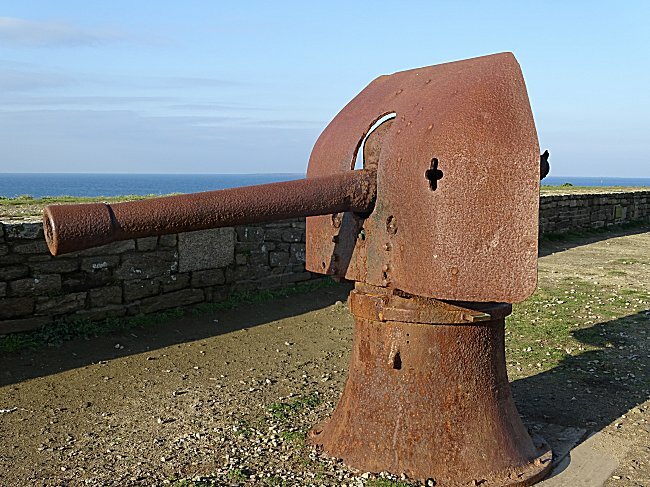 We think this granite gun could be a decoy1. 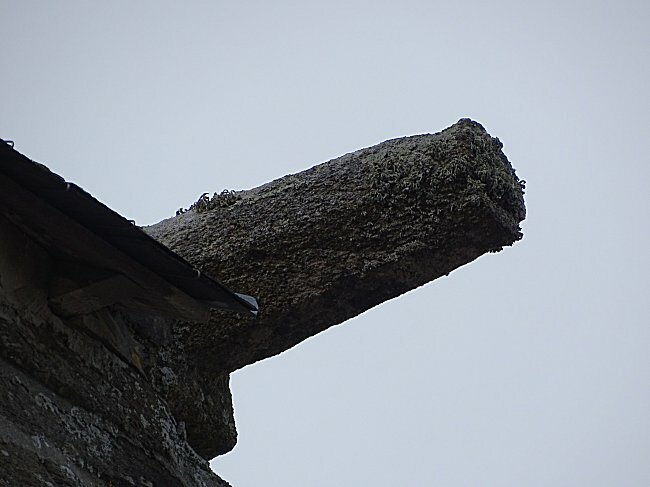 An architectural element of deterrence, in a way, for those who do not yet have a telescope2 to detail it. 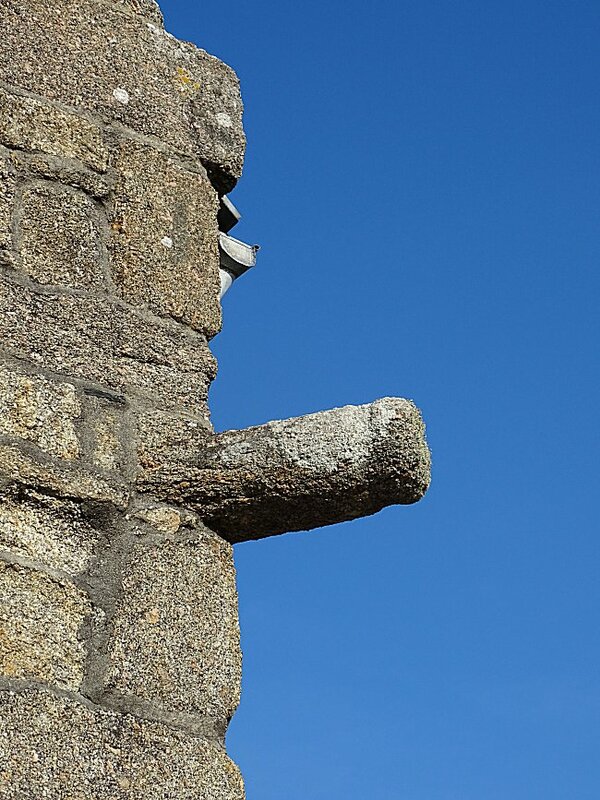 Now let's go to the church of Le Conquet. Under the first gallery of the bell tower, four protruding sculptures can be seen. They're still not gargoyles. Those located at the corners of the facade represent animals. Only those on the opposite side show a cannon. How old are these sculptures? 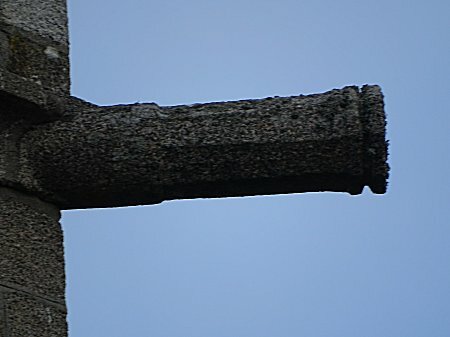 As can be read on our page dedicated to this church, the whole building has been moved to be transferred, stone by stone, from the hamlet of Lochrist located 2 km away, until here, in the centre of the town	( Sainte-Croix Church	). This titanic work took place from 1856 to 1858. The sculptures being very eroded, it is likely that the four cannons were already present on the old bell tower. And this one could well go back to the XVI th century, i.e. following the destruction and looting of the Conquet by the English in 1558. Now let's take the coastal road to Pointe Saint-Mathieu. We will discover real cannons there. 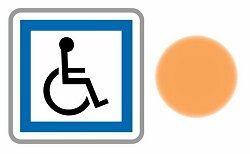 Access :	Park in the large parking lot and walk to the cenotaph in memory of the sailors who perished at sea, which the path bypasses. 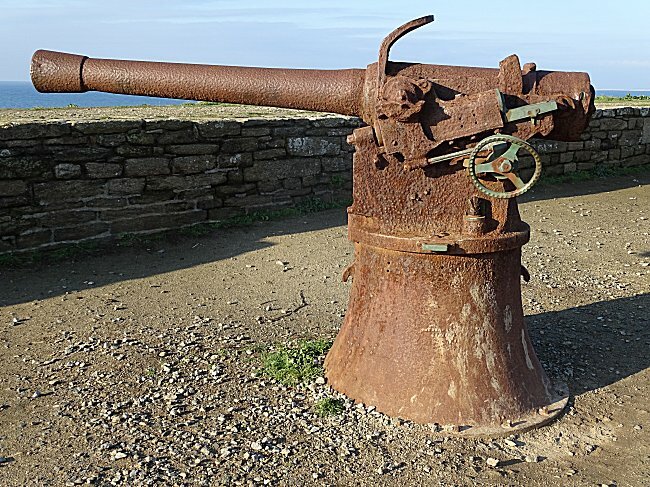 There are two old rusty cannons facing the ocean. But we have to get closer because they have things to tell us. On the chassis of one of them, we can still read "Schneider Le Creusot 1877". On one of the tubes "Tarbes AC 1882". 1877 , 1882 ! Almost a century and a half ! They were built after the War of 1870 ! 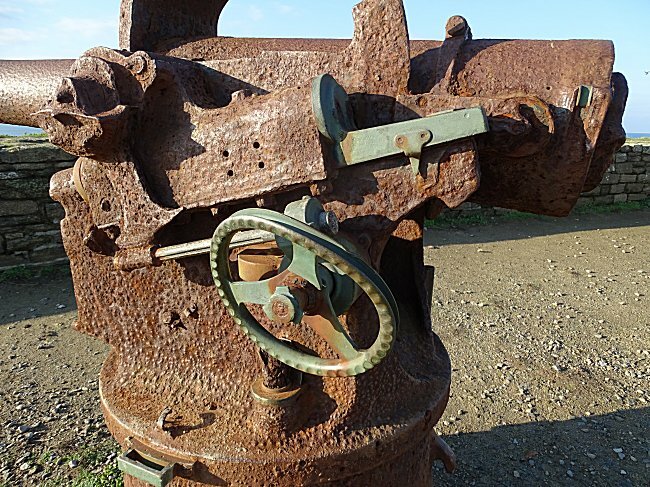 It is easier to understand why steel has rusty a little here at the tip of Europe under the salt spray of the ocean. Specialists will tell you that these are 95 mm guns, model Lahitolle 1875 and 1888, the first steel guns made in France. Equipped with a screw breech, but without a recoil brake, they were not very suitable for field artillery. The heaviest, with its armoured mask, weighs nearly 3 tons. It was better to fix them to the ground. Between the wars of 1870 and 1914, we learned at school that Germany was the great enemy of France, and that it was necessary to be constantly on guard and above all to protect the Brest harbour from the incursion of possible submarines... These guns were installed in the concrete cells of batteries attached to the large-calibre shore batteries. 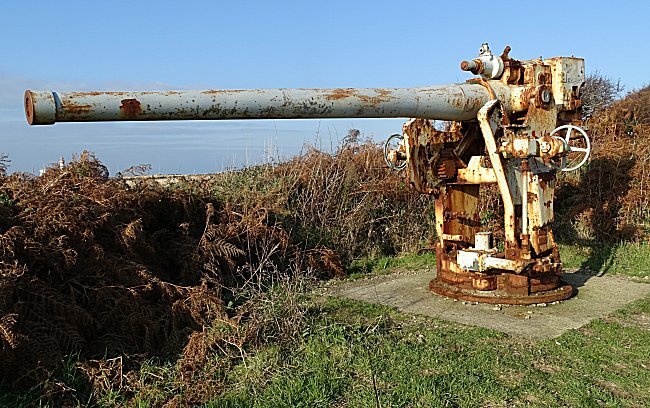 From 1917, the defence of the coasts was transferred to the Navy, which installed these old parts to defend lighthouses, semaphores and small ports because these powerful guns could still deter a submarine from attacking these objectives. To see them today in such a sorry state, it really doesn't look like they were able to send a 12 kg shell at a speed of 400 m/s ! 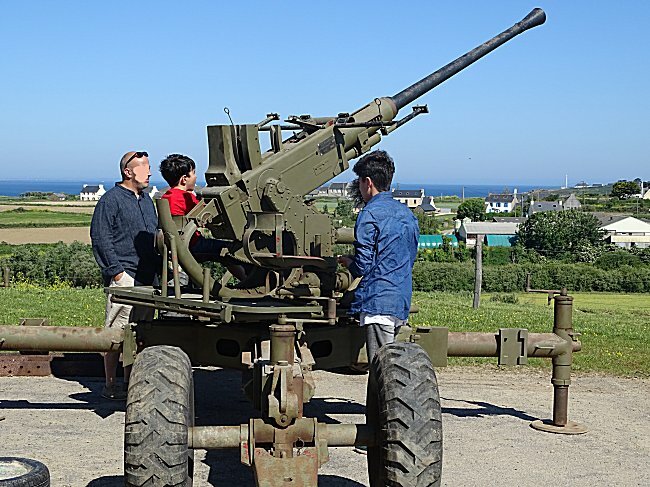 After a moving thought for the venerable artillerymen who served these rare witnesses of our coastal military heritage, let us take the road again towards Plougonvelin for a last stop near the shore. Access :	Sur la route de Plougonvelin, 500 m après la fin de l'agglomération de St-Mathieu et face au musée de la Seconde guerre mondiale, prendre à droite la route menant vers Les Rospects jusqu'à l'aire de stationnement. 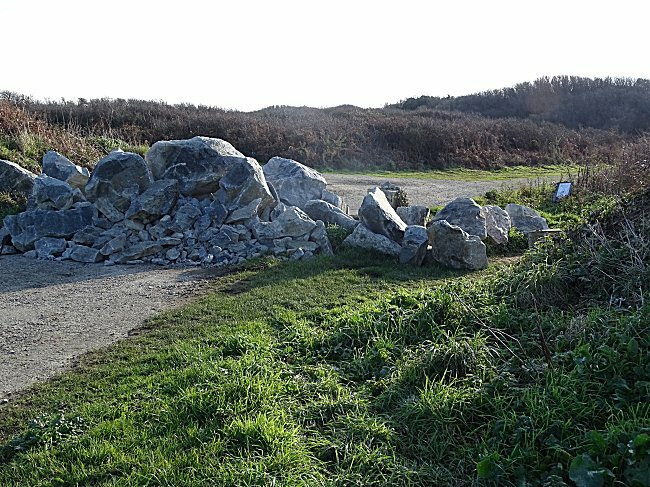 A barrier of boulders deposited there with remarkable aesthetic concern prevents vehicles from approaching the guns. But on foot, for an able-bodied person, there is no problem getting around the obstacle. At 50 m, guarding access to a row of bunkers, two cannons await us. 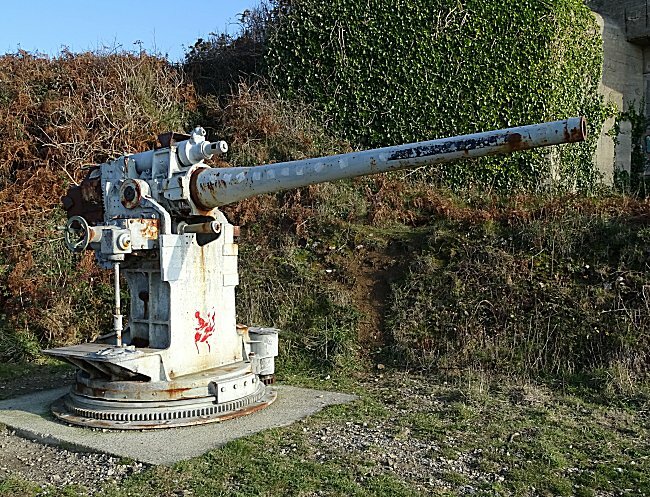 These two weapons, one 57 mm calibre and the other 75 mm calibre, were anti-aircraft guns of the French Navy. 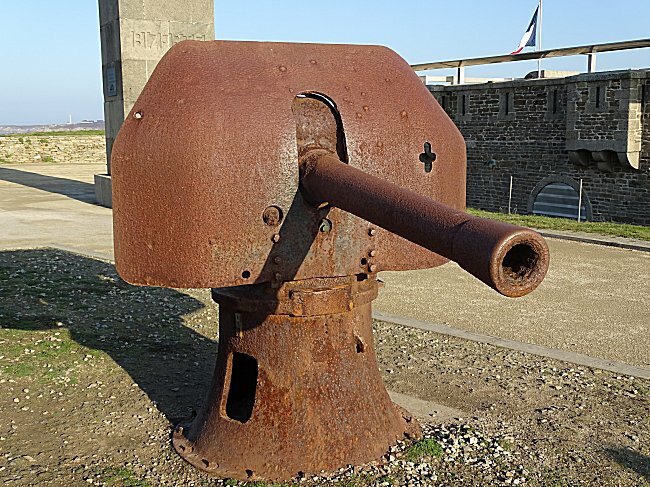 Landed when the units on which they were fixed were disarmed, they were used by the GERBAM (Groupe d'Etudes et de Recherches en Balistique, Armes et Munitions) at its Gâvres site (Morbihan) for ballistic tests. But in 2010, this site, which was included in a Natura 2000 area, was decommissioned in order to restore the site in accordance with European directives. The gun depot was intended for scrap metal. Several municipalities, including Plougonvelin, then acquired certain pieces in order to expose them to the public. These two marine guns are part of it. On returning to the road to Plougonvelin, we will not miss the visit, just opposite, of the Memorial Museum 39-45 opened in 2017 in the former Kéromnès firing command post. It is the work of two brothers who were passionate about the history of the last war, who gave up their profession to present their important collection to the public. You will find an overview on our page dedicated to this museum whose upper terrace offers visitors an extraordinary panorama on the Iroise Sea. ( museum visit	). During the Occupation, this command post directed the fire of the powerful German defensive unit at Keringar, which had, among other things, three huge 280 mm guns that could fire 240 kg shells 30 km away ! These terrifying monsters have been dismantled and their gigantic concrete shelters are empty. As you leave this terrace, you can see up close a 40 mm Bofors anti-aircraft towable gun, manufactured in Canada under Swedish licence, and used by the Allies at the Liberation. 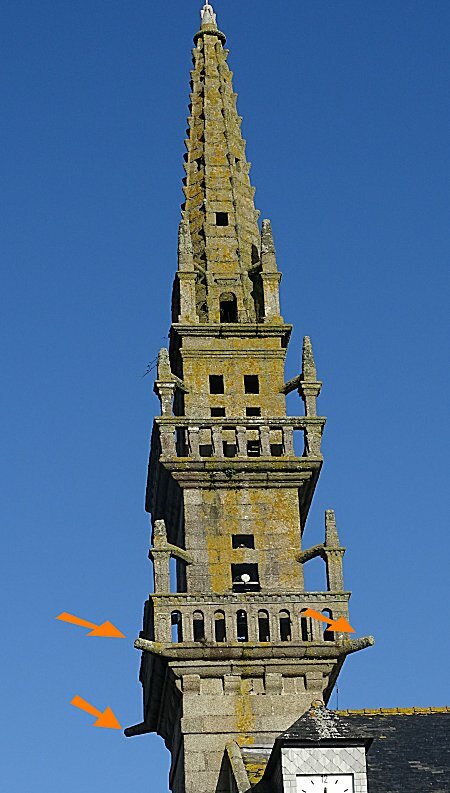 To finish this journey, let's go back to the road to Brest and in the crossing of Kerfily, let's turn left towards Locmaria-Plouzané where we can park at the foot of the bell tower. 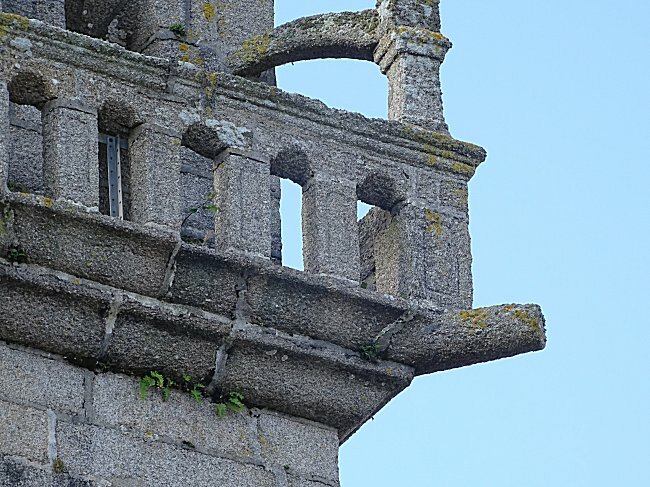 Once again the bell tower of a church shows with these stone cannons its maritime and defensive character. Notre-Dame Church, built in 1779, replaced an older building that already had to display these ornamentations. Of circular section, these 4 guns are placed like real gargoyles, at each corner, under the upper gallery. This concludes our journey, which shows how much the Pays d'Iroise is keen to preserve the memory of the battles that have marked its entire history. Discovering this ancient heritage means becoming aware of the importance of the Breton maritime border for our country as a whole. It is also to imagine the anguish, fears and heroism of a coastal population in such frequent insecurity that they wanted to engrave them as a message in stone. 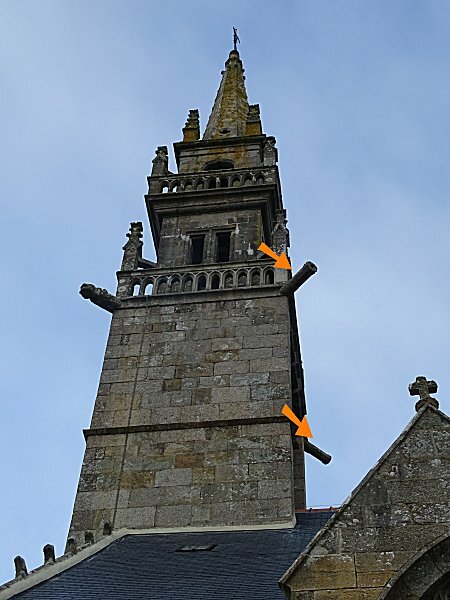 -1- See on the internet the opinion of Michel Le Goffic, archaeologist of Finistère, on the stone guns. -2- The first telescopes date from the end of the XVIth century. Galileo perfected them in 1609. But providing an inverted image, they were only used in astronomy. 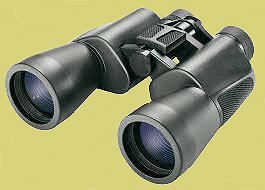 Approach telescopes, land or sea, requiring an image straightener, are therefore older than 1609. 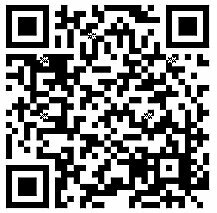 Thanks to Maj. Roger Coguiec, the association Brest-44 and Mr. Patrick Jaubert for their help and the accuracy of their information.